Toddler toys provide much more than entertainment. When toddlers engage in play, they are actually engaged in learning. It is through play that toddlers develop an understanding of how their world works. Toddlers need to explore, discover, experiment, imitate, and create in order to develop and hone basic skills. Sorting toys help toddlers learn concepts such as shapes, numbers and making connections between objects. 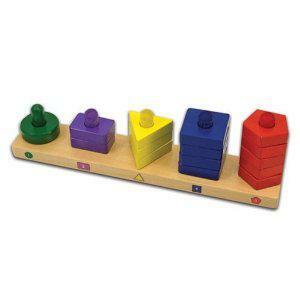 The Stack & Sort Board helps toddlers learn their colors and shapes as they sort the wooden blocks onto the pegs. They can also count the blocks as they stack them from a stack of one to a stack of five. Melissa and Doug's Wooden Shape Sorting Clock teaches children multiple concepts. They can practice sorting the blocks in the clock by shape, color or number. As they get older the clock is also useful for learning how to tell time. Playing with blocks in a variety of shapes and textures helps children develop their coordination and build creative thinking. At first they may simply focus on tearing down the towers that you build, but soon they will be learning to balance blocks as they stack towers high and build other creations. 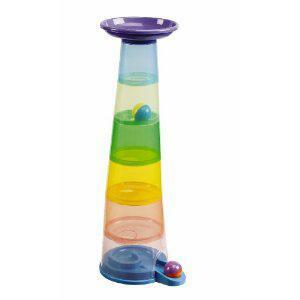 The Stack n Roll Tumbling Tower is a stacking toy with a twist. Once toddlers have finished stacking and balancing the plastic cups the toy turns into a fun tumbler. Toddlers will scramble to build the tower so they can drop the balls in the top and watch them appear out of the bottom of the tower. 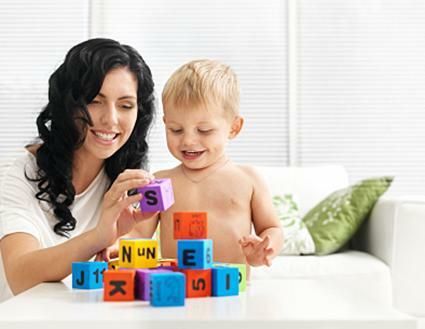 Fisher-Price's Little People Stack and Learn Alphabet Blocks are brightly-colored, square shaped blocks that feature the letters of the alphabet. Children will learn their letters as they stack the blocks into different configurations. They can make words or just randomly choose the blocks they use. The blocks are also compatible with the Little People series and the set even comes with a Little People dog to sit right on top. With Jumbo Cardboard Blocks, children can build towers as tall as they are. These lightweight blocks are designed to look like colorful bricks. Children can use them to build simple towers or go even further and build forts, large castles and other toddler-sized creations. Ride-on toys give toddlers, who may or may not be steady on their legs, a chance to roam. Whether they are exploring the inside of their house or traveling around the neighborhood, they'll enjoy it more when they are behind the wheel. 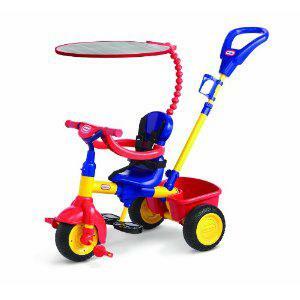 The Little Tikes 3-in-1 Trike is designed to grow with your toddler. When they are just starting out, you can strap them on the trike and push them around. As they learn to pedal, the handle can stay on to keep you nearby, but once they are ready to take off, the handle comes off too and they can fly. For over 30 years the Little Tikes Cozy Coupe has been entertaining toddlers. Toddlers will get exercise and explore their neighborhoods as they use their feet to move this classic toddler car down the sidewalk. The Step 2 Push Around Buggy gives toddlers a bit of independence while still keeping mom close by. As they drive the car around, an adult pushes the car with the handle at the back. It also features a cute storage bin in the front for toddlers to store all the treasures they find on their ride. Puzzles develop multiple skills in children. Not only do they build their problem-solving skills, but toddlers also learn about shapes, concentration, and coordination. Many puzzles also feature animals, letters, and other scenes designed to help children learn. Children will build their puzzle skills and play a game of hide-and-seek with the Fisher-Price Discover and Learn Chunky Wood Puzzle. The puzzle features a cute barn scene with animals hiding behind the puzzle pieces. As children take out and put the pieces back in they will learn more about the animals that live on the farm. 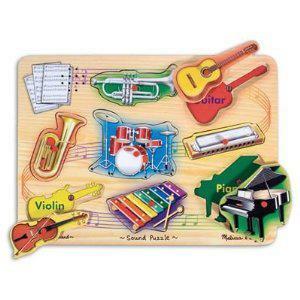 The Melissa & Doug Wooden Musical Instruments Sound Puzzle features nine different instruments. As toddlers replace a piece it makes the sound of the instrument. Instead of catching real bugs, toddlers can catch bugs with the Melissa & Doug Bug Catcher Puzzle. The puzzle features a net with a magnetic rod attached to it which toddlers can use to pick up and replace the pieces of the puzzle. Pretend play toys encourage toddlers' creativity. They also get a chance to pretend to do some of the same things that mom, dad and their older siblings do. This helps them build self-confidence and a sense of independence. 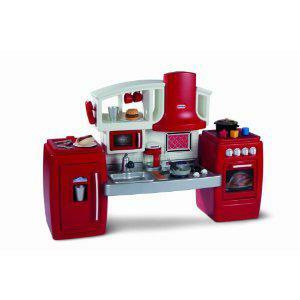 The Cook 'n Grow Kitchen from Little Tikes may be arranged in multiple ways to allow it to grow with your toddler. Children will love whipping up pretend dinners in their very own kitchen and gain a sense of pride as you gobble them down. It is never too early to start hosting tea parties. The Fisher-Price Laugh & Learn Say Please Tea Set has a musical teapot and fun pretend snacks to serve at the tea party. Toddlers, especially little girls, will love serving their family members, stuffed animals and anyone else they can find willing to join their party. With the Little Builder Tool Belt, kids can put on their tool belt, pull out their toys and help mom and dad as they fix things around the house.The toy comes with four tools, including a screwdriver with both a flat and Phillips head. Musical toys give toddlers a chance to express their natural rhythm and be creative as they compose their own tunes. With the Sesame Street Let's Rock! 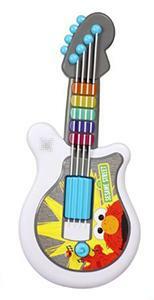 Guitar toddlers can rock along with Elmo, Cookie Monster and their other favorite Sesame Street characters. The guitar can be combined with the Let's Rock! Elmo, microphone and keyboard to create an entire band. The different instruments communicate to allow multiple toddlers to play the same song at once. Toddlers will make music all day long with the 4 in 1 Drum Set. They can practice making rhythms and playing along with their favorite tunes on the drum, tambourine, rattle and clacker included in the set. Bath time is just an extension of play time. When they have toys to play with in the bath tub, toddlers are less likely to focus on the less desirable parts of taking a bath, such as getting their hair washed. 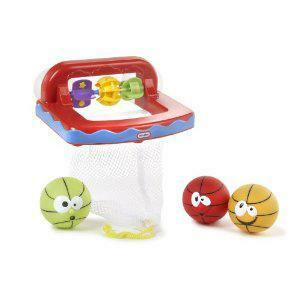 Play basketball in the tub with Little Tikes Little Champs Basketball. It comes with three colorful balls, suction cups to easily attach to the tub wall and a mesh net that closes for easy storage. The Alex Rub-a-Dub Tub Tunes Symphony comes with three instruments for making music in the tub. Toddlers will enjoy banging on the drum, learning to play the water flute or tapping out their favorite tunes on the xylophone. Song cards are included in the bath set. Look for toys that can be played with in multiple ways. Choose a variety of toys, not multiple toys that do essentially the same thing. Try to find toys that don't require batteries so you do not have to worry about replacing them all the time. Buy durable toys that will stand up to being dropped, thrown and mishandled by a toddler. Avoid toys with small pieces that pose a choking risk for children under 3. While toddlers can play with many of these toys on their own, it's even more fun when you join in. Don't be afraid to whip up masterpieces in the play kitchen or rock out on your toddler's guitar. It may seem silly to you, but your toddler will embrace the play time and will enjoy making memories with you.